Our approach to power protection revolves around the nine most common power problems that may affect your critical systems. You can choose from a variety of power protection solutions with varying levels of effectiveness and price that will shield critical data and equipment from some or all of the 9 power problems. Description: Total loss of utility power: Causes electrical equipment to stop working. 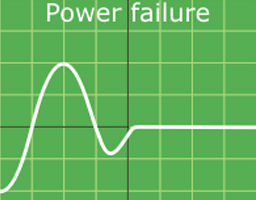 A power outage (Also power cut, power failure or power loss) is the loss of the electricity supply to an area. Causes: The reasons for a power failure can for instance be a defect in a power station, damage to a power line or other part of the distribution system, a short circuit, or the overloading of electricity mains. Effect: Equipment shutdown, loss of work and data, file and hard disk and OS corruption, loss of fiber optic, T1 and ISDN connections. Description: A short-term decrease in utility voltage 80 to 85 percent below normal for milliseconds to a few seconds. Causes: Triggered by the startup of large loads, utility switching, utility equipment failure, power supply that’s too small for the demand. Effect: Shrinking display screens, memory loss, data errors, equipment shut-off, file and hard disk and OS corruption, system crashes. Description: A short-term high voltage above 110% of nominal. in the range of microseconds. 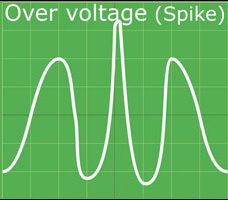 A spike is similar to a surge, only stronger and more severe with a rapid voltage peak of up to 6,000 volts. A spike can literally fry your hardware! Causes: Surges often occur after shutting off a high-powered electrical device. When you turn off one juicy-hungry device, the electrical line will momentarily keep pumping at a higher rate and cause a surge. Causes include lightning, power line switching, motors, copiers, laser printers. Other transients can be created by an electromagnetic pulse (EMP) with electromagnetic energy distributed typically up to the 100 kHz and 1 MHz frequency range. Effect: Almost always results in data loss or hardware damage. 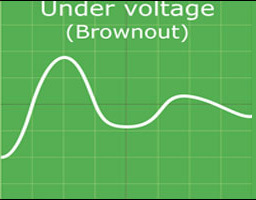 Description: Increased voltages for an extended period of time. 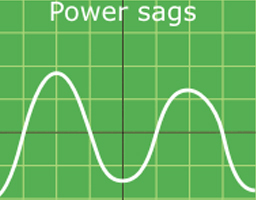 Causes: Nearby utility substations, utility fault, generator fault, load factor. Effect: Electronic and electrical devices are designed to operate at a certain maximum supply voltage, and considerable and even permanent damage can be caused by voltage that is higher than that for which the devices are rated. 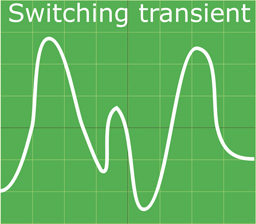 Description: A decrease in utility voltage for an extended period of time from few minutes to few days. Causes: Reduced power supply voltage by utility, heavy loads, low generator output. Effect: Shrinking display screens, equipment hang or reset, equipment power supply damage, Computer hangs, computer and network equipment reboots or hangs, loss of work and data, file and hard disk and OS corruption. Description: Random, sporadic, or unwanted electrical signals of high frequency or electro magnetic interference from other equipment that become part of a transmission making signal or information more difficult to identify. Causes: Caused by Radio Frequency Interference (RFI) or Electromagnetic Interference (EMI) generated by electric motors, relays, motor control devices, broadcast transmissions, microwave radiation, welding devices, poor grounding, fluorescent lighting, distant electrical storms , etc. Effect: May cause data loss, storage loss, hardware damage, reduce life expectancy of electronic components, slow LAN due to excessive errors, audible noise in telephone and audio equipment and system lockup. Description: Deviation from the nominal frequency (50 or 60 Hz): Causes motors to increase or decrease speed. Unsteady frequency with high tolerance. 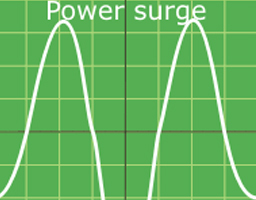 Causes: Caused by erratic operation of emergency generators or unstable frequency power sources. Effects: Can cause erratic operation, data loss, system crashes and equipment damage and program failure. Description: Instantaneous Under voltage( Notch ) in the range of Nanoseconds. Causes: Commonly caused by arcing faults and static discharge. In addition, major power system switching disturbances initiated by the utilities to correct line problems may happen several times a day. 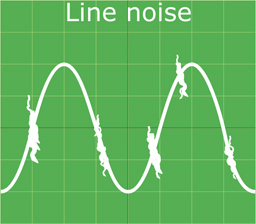 Effect: Slow LAN due to excessive errors, audible noise in telephone and audio equipment. May cause erratic behavior in some equipment, memory loss, data error, data loss and component stress. 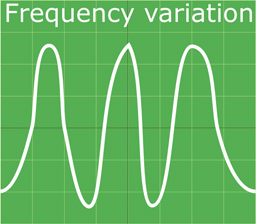 Description: An alteration of the pure sine waveform (sinewave distortion), due to nonlinear loads. 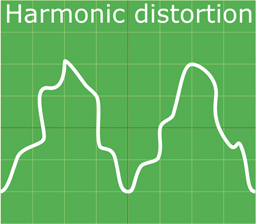 Causes: Harmonic distortion can be generated by a load and fed back into the AC mains, causing power problems to other equipment on the circuit. Generally transmitted by nonlinear loads. Switch mode power supplies, variable speed motors and drives, process equipment, PR copiers and fax machines are examples of non-linear modes. Effect: Can cause excess heating in motors, transformers and wiring; communication errors; hardware damage and lowers operating efficiency of office equipment. To get the most dependable power source to keep your systems running without interruption and to insulate your systems from these problems, get Makvolt power protection solutions.